Daily Slideshow: You could divide the country into a bunch of different regions, or even do each of the 50 different states, but for the sake of brevity, each one roughly covers one of the four time zones. This piece will feature the Mountain Time Zone including Montana, Wyoming, Colorado, Utah, New Mexico, Idaho, and Arizona. The Beartooth Highway is a 67-mile stretch of road between Red Lodge, Montana and the Wyoming state border. 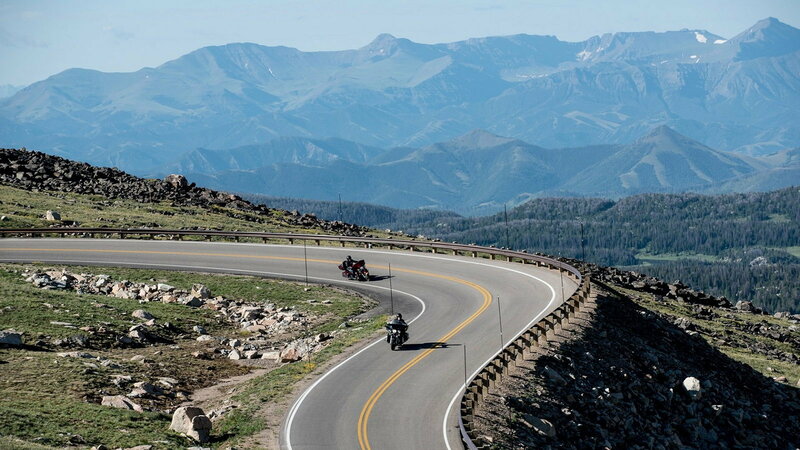 Considered by some to be one of the best roads in America, the Beartooth Pass route is one of the 31 All-American Roads named by the Department of Transportation for exhibiting a number of exemplary intrinsic qualities. This route will take you to elevations up over 11,000 feet and features steep grades, switchbacks, and numerous hairpins. The luscious scenery includes a number of lakes and seeming never-ending wilderness that will make you want to stop just to enjoy the view. Plan on visiting this route between May and October, as high winds and snow storms will regularly close the road during the winter months. Beginning in Red Lodge, MT, head south on Highway 212. You will remain on Highway 212 throughout the entirety of the ride, but after passing through Rock Creek Vista, you will cross the state border into Wyoming. Eventually, you will cross back into Montana and finish the ride near Cooke City-Silver Gate, which is an awfully long name for a town with less than 150 people. The Google Map is here. 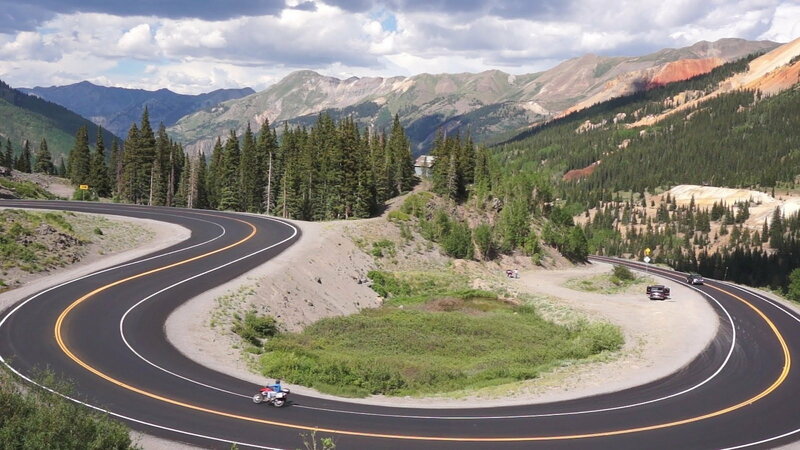 Another fantastic All-American Road is the San Juan Skyway Loop in Southern Colorado. The 233-mile route traverses the San Juan Mountains, which are arguably the most stunning sections of the Rocky Mountains. With an endless supply of switchbacks, hairpins climbs, and descents, this loop attracts riders from all over the country. Be prepared to see epic mountain peaks, rich river valleys, dense forestry, steaming hot springs (plan a stop in Ouray for a soak), and red-rock canyons as you make your way through various towns, parks and resort areas. Whether you complete the ride in a day or make a weekend of it, this ride should be part of every rider's bucket list. With this route being a loop, one can enter and exit at various places and still complete the whole ride. 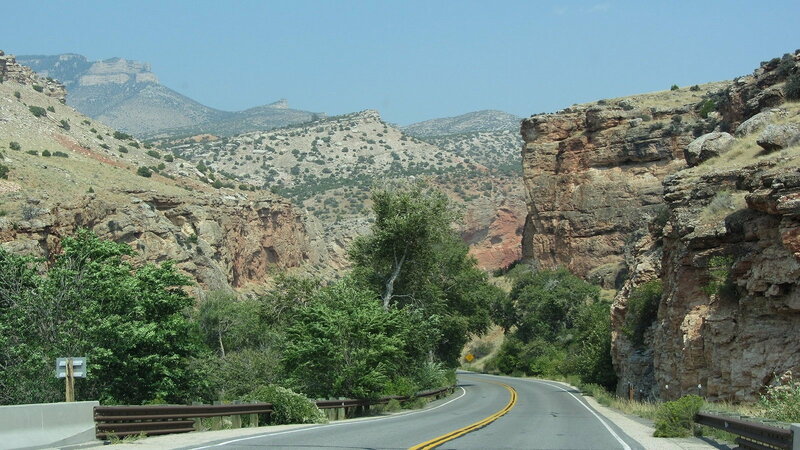 The three major roads include Highway 62 from Ridgeway to Placerville, Highway 145 from Placerville to Cortez, Highway 160 from Cortez to Durango, and Highway 550 from Durango to Ridgeway. You can look at the Google Map here. >>Join the conversation about these Mountain Routes right here in HDForums. The Coronado Trail is a nationally recognized Scenic Byway that sees over 300 twists and bends in this remote area of the Arizona countryside. The ride has approximately 5,500 feet in elevation changes and will literally take you from a desert environment with cactus and yucca to an alpine Eden in a matter of hours. Be prepared to see old copper mines, cliffs, canyons, meadows, and forests as you work your way through this 3+ hour ride. Roadside amenities are non-existent, so be sure your tank is filled because no gas stations appear between the starting and ending points of the route. 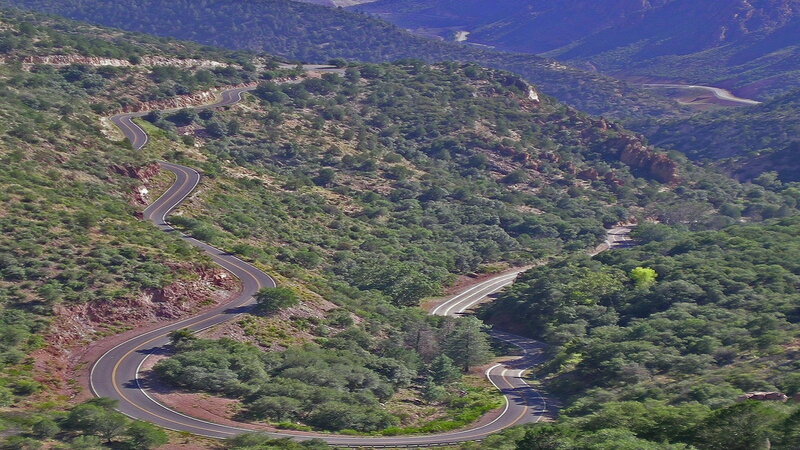 Beginning in either Springerville or Clifton, simply ride the Highway 191 in its 120-mile entirety. The area can be seen via Google Maps here. The Walden Loop is a long ride that snakes its way through The Roosevelt National Forest and Rocky Mountain National Park. The route is packed with an abundance of wildlife and offers various views of canyon rock walls, flowing rivers, and beautiful mountain lakes. There are a good number of amenities and lodging available for those looking for an extended stay, and while most agree that the ride can be completed in a day, it's best to take your time and enjoy the magnificence that nature has to offer. Starting in Fort Collins, take US 287 north to Highway 14 west. 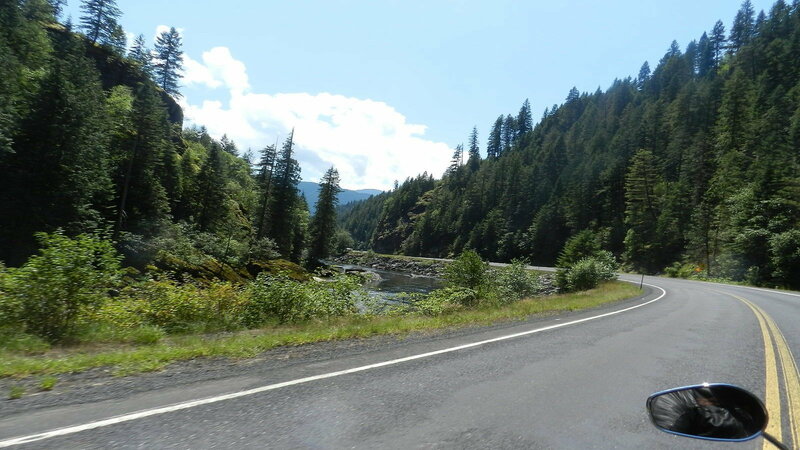 Ride Highway 14 across the Roosevelt National Forest to Walden. Take Highway 125 south down to Granby where you will hop onto US 34 east and make your way through the Rocky Mountain National Park back to Loveland. Once in Loveland, simply take Interstate 25 to get back to Fort Collins. A Google Map of the area can be found here. Few places in the world have the allure that the immense rock layers of the Escalante National Monument provide. As if the open roads with hills, twists, and turns were not enough, the Grand Staircase route offers just about every type of landscape and terrain that Utah has to offer. Expect to see the multitude of colorful cliffs, canyons, mesas, and plateaus of the renowned Bryce Canyon, Red Canyon, and Grand Staircase Monument. This is a technical road that is best enjoyed at a moderate pace because gusting winds and limited guardrails can make this dreamy ride become a nightmare in a hurry. 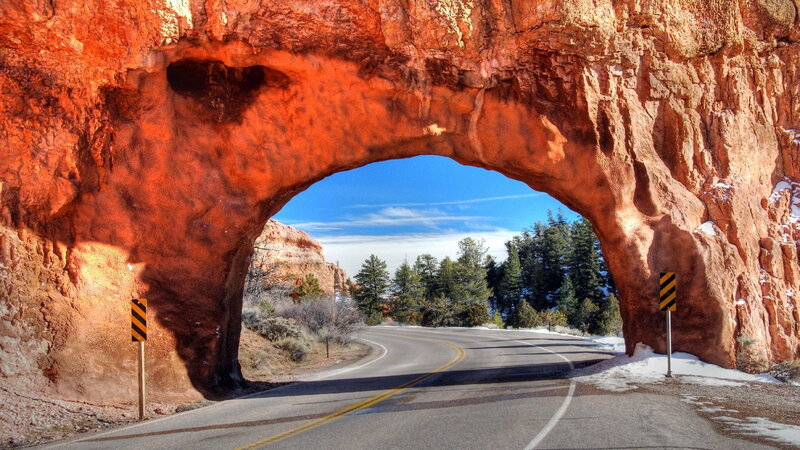 Beginning in Panguitch, take US 89 south for 9 miles before turning east onto Highway 12 towards Bryce Canyon. Stay on the 12 for the remainder on the ride until arriving in Torrey. Start planning with a peek at the Google Map here. In terms of the road itself, many prefer The Lolo Pass ride over great rides like Beartooth Pass or The Grand Staircase. Instead of being filled with low-speed hairpins and tight switchbacks, Highway 12 offers fast-paced sweepers to give riders a better sense of speed and freedom. The route follows the Lochsa and Selway rivers as they wind their ways through the scenic mountain pass. The road quality is quite good, but can occasionally get a bit congested with big rigs and sightseers. With that said, one would be hard pressed to pass up any road with a sign that reads "Curves Next 99 miles." Directions don't get much easier than this: Simply hop onto Highway 12 in Lewiston, ID and ride it east all the way into Missoula, MT. You can follow the route on a Google Map here. The Peak to Peak Highway in Colorado is another National Scenic Byway known for its magnificent mountaintop views and natural forest scenery. While it is a fairly short 55 miles, it is packed full of attractions such as Rocky Mountain National Park, Golden Gate Canyon State Park, Eldora Ski Resort, and the Roosevelt and Arapaho National Forests. The route was repaved a couple of years ago, making the combination of flowing curves and brisk sweepers that much better. This byway can be completed in a little over an hour, but it is highly recommended that you plan for at least 2-3 hours to take in some of the great scenery nature has to offer. 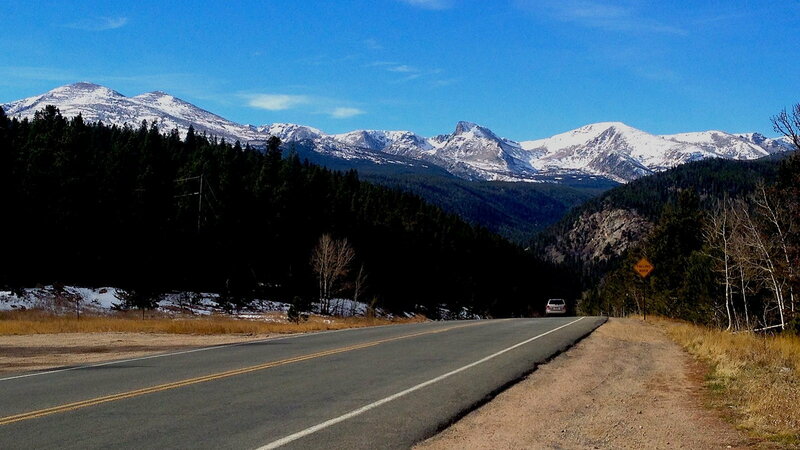 Beginning in Black Hawk, CO, take the Highway 119 North all the way up to Estes Park. The area can be explored via Google Map here. 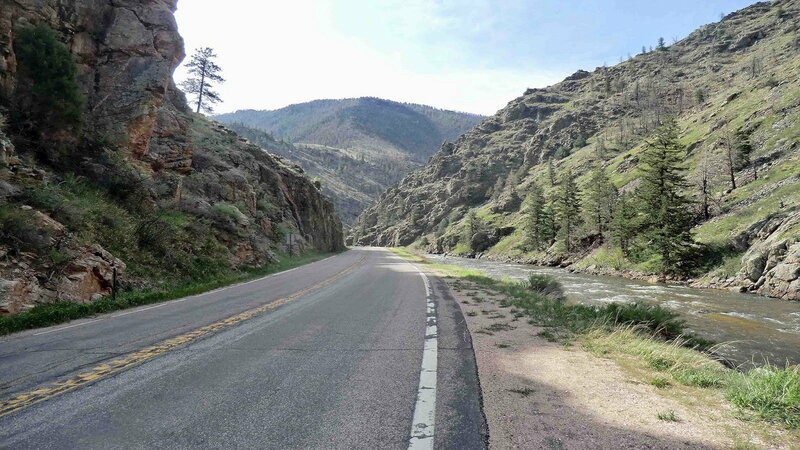 The Wyoming Big Horn Mountain Loop is a fabulous ride that incorporates the Big Horn Scenic Byway with several stints through the Big Horn National Forest. As with the other routes on our list, the Big Horn Loop features its share of awesome meadows, waterfalls, dense forestry, curvaceous canyons, and a variety of wildlife. The loop offers numerous points of interest inside and out of the park that can be enjoyed in as little as a day or over the course of a week. For those looking for a little less lengthy ride with lots to offer, the Scenic Byway Route begins in Shell, WY and works its way 58 miles up US 14 to Burgess Junction. Beginning in Sheridan, head west on Highway 330. The 330 will turn into 74, 98, and eventually Highway 67 before entering Dayton. From Dayton, take US 14 west to the National Forest. At Burgess Junction, be sure to stay on US 14 instead of 14A (alternate route). US 14 will run all the way into Greybull where you can then head south on US 20 to Manderson. In Manderson, take Highway 31 to Ten Sleep. From Ten Sleep, US 16 will take you back through the national forest before ending in Buffalo. Getting back to Sheridan is just a quick 25-mile trip up I-90 from here. You can see the whole area on Google Maps here. The Road to Timberon is an excellent scenic route located in New Mexico's Lincoln National Forest. The road is known for its healthy number of curves, bends, and elevation changes with little to no traffic, but also features some great canyon scenery and even views of the famed White Sands National Monument. There is only one way into and one way out of Timberon that is paved, so be sure you have enough gas and get a bite to eat when passing through the town of Cloudcroft as there are no gas stations from that point on and none in Timberon. While this ride may be a bit lacking in length, it more than makes up for it with its road quality and natural valley/canyon scenery. Beginning in Mescalero, head south on US 70 and take the Highway 244 exit. Highway 244 will run into US 82. Take US 82 west to the town of Cloudcroft before turning south onto Highway 130 towards Timberon. Ride the Sunspot Highway until reaching Timberon where you must turn around and head back. It is about 65 round trip from the gas station at Cloudcroft to Timberon and back. The Google Map of this area is here. Last, but definitely not least, we have the epic Going-to-the-Sun Road located in the heart of Montana's Glacier National Park. Known by many as the Mt. Everest of motorcycling routes, Going-to-the-Sun Road is frozen for many months of the year and requires moving large amounts of ice in the early spring to accommodate travelers. That said, when the road is open, it is a grand venture indeed. The route features a supply of elevation changes and twisty curves as you make your way over 6,500 feet up to Logan's Pass. Be ready to see amazing glaciers, lakes, waterfalls, streams, and numerous alpine wildlife. 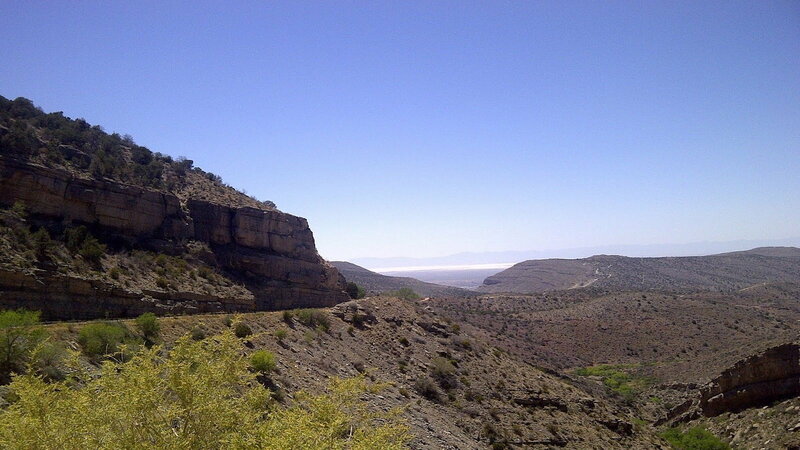 Although the ride will only take about an hour, there are countless turnouts and sightseeing areas to take in the view. Be sure to bring your camera along on this ride! 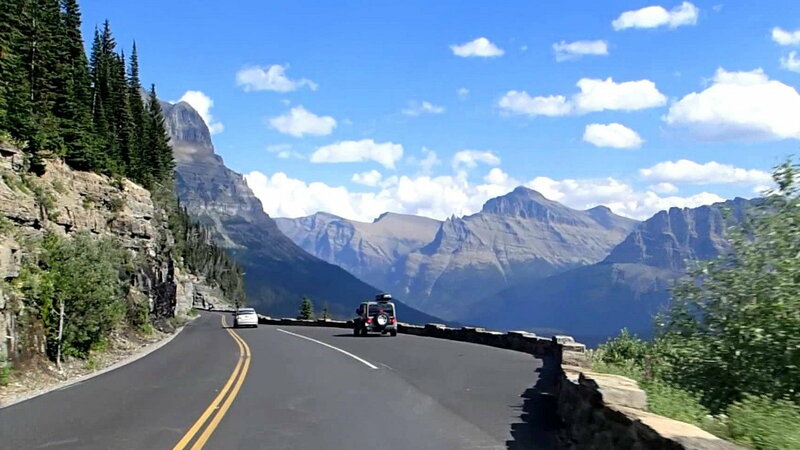 From St. Mary, simply jump onto Going-to-the-Sun Road and ride it in its entirety through Glacier National Park to the town of West Glacier. You hardly need a map, but here is the Google Map of the area.